Winning the ball from the dallying Scott Ross on the edge of the area, Kenny Miller fed Harry Forrester just inside the area, and it required a save from ex-Ger Graeme Smith to send the ball clear for a corner. That effort was the cue for a period of sustained pressure on the Peterhead goal, with Andy Halliday next to try his luck after dancing his way into the area, and again Smith was there to keep the Blue Toon’s goal intact. But eventually, the door caved in. Miller did superbly well to reach the byline down the left wing, and in attempting to clear it and prevent the ball reaching a sea of charging blue shirts that were making their way to the back post, Ally Gilchrist poked the ball beyond Smith and into the net. It was a horror moment for the central defender, but it gave Rangers the breakthrough they craved and with that goal in tow, they began to exert full control over the match. Miller came close again to netting a goal of his own as Halliday picked him out with a superb ball onto his head on the penalty spot, but Smith did superbly well to get down quickly and gather the goalbound effort from the ‘Gers striker. James Tavernier has made a real name for himself this season with his goalscoring exploits, and he was next to test Smith from the edge of the area, but his shot was easily gathered by the ‘keeper. He wasn’t to be denied for long though, as he netted yet another goal of the season candidate. Kenny Miller brought down a loose, bouncing ball 25-yards from goal and found Tavernier lurking to his right. With the ball still in the air, he rocketed an incredible volley into the top corner to at last hand his side the cushion they deserved. But that cushion was almost wiped out straight away. With their first corner of the game, Scott Ross’ header looked set for the net, but on the line was Jason Holt before Tavernier picked up to scramble the ball to safety. 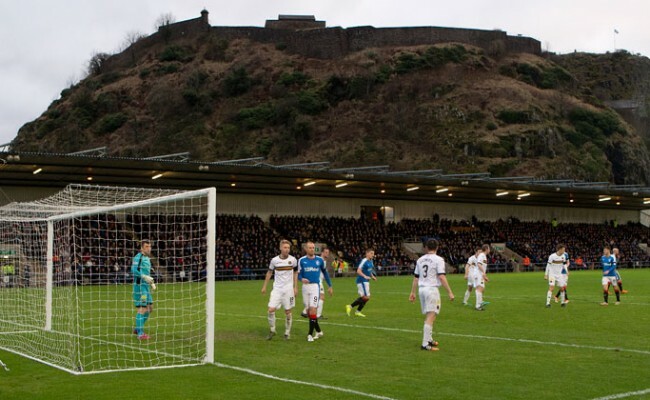 The second half began with yet more Rangers possession and efforts on goal, the first of those coming from Halliday, with his shot from just inside the area being deflected over for a corner kick, before Barrie McKay worked a yard for a shot, his try being deflected into Smith’s arms by Simon Ferry. The game really should have been put to bed on the hour mark through Halliday, as he met a superb Harry Forrester cross with his head right in the middle of the goal, but somehow he skewed the effort wide when it seemed easier to score. 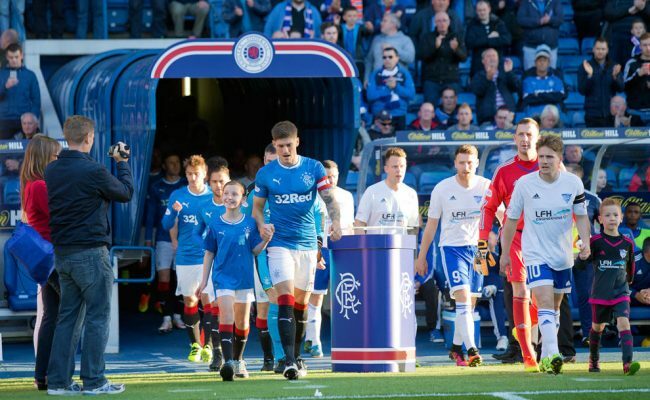 With an eye to next week’s Scottish Cup semi-final, Captain Lee Wallace and Harry Forrester were replaced by Michael O’Halloran and Billy King respectively, with those two new additions being involved in ‘Gers next goalscoring opportunity. O’Halloran picked up in midfield and charged forward before finding the run of King, but his touch let him down and the ball ran into Smith’s arms. So often a hero at Hampden Park, Kenny Miller would have been desperate to get on the scoresheet, but his best effort to date was a weak header from a McKay cross that Smith took with ease. That was until Tavernier cut the ball back across the face of goal for him, but the ball looked to take a bobble and with an open goal in front of him, the ball went loose. That sparked a period of intense Rangers pressure however, as somehow Halliday failed to score from three yards out, with Smith there again to deny him, before Tavernier found himself one-on-one with the Peterhead ‘keeper, and again he saved. The third and clinching goal wasn’t too far away however, and it came from the penalty spot after Jason Holt was tripped at the end of a mazy run into the area. Up stepped Halliday to bury the ball beyond Smith to at last clinch the Petrofac Cup for Rangers at the fourth attempt. The day wasn’t over just yet though, with Kenny Miller at last grabbing his goal, tapping home an O’Halloran cut-back at the back post in injury time to add some gloss to the afternoon for Mark Warburton’s side. RANGERS: Foderingham; Tavernier, Kiernan, Wilson, Wallace (O’Halloran, 65); Ball, Halliday, Holt; Forrester (King, 65), Miller, McKay (Shiels, 78). SUBS NOT USED: Bell, Law, Clark, Zelalem. PETERHEAD: Smith, Noble, Ross, Gilchrist, Strachan (Stevenson, 25), Redman (McIntosh, 65), McAllister, Sutherland (Riley, 58), Dzierawski, Brown, Ferry. SUBS NOT USED: Jarvie, Blockley, Ferries, Rodgers.